The papers are from Anna Griffin (bought on eBay a couple of years ago) and the sentiment is from Stampin' Up! 's Vintage Labels. 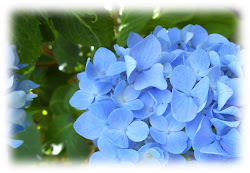 As for the wedding we attended, I have a cute story to share. My cousin's new husband is a HUGE Phillies baseball team fan. And, HE is a bigger scrapbooker than SHE is, and the scrapbooks are all about sports. 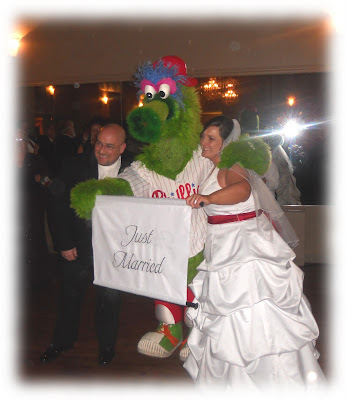 As a wedding surprise, the bride arranged for the Phillies team mascot, the Philly Phanatic, to come to the reception. It was a BLAST! The groom was completely surprised and overwhelmed with emotion when the Phanatic walked in. His new wife started off their marriage in a very wonderful way! I'm sorry I don't have time to post a supply list for this card; dinner is almost ready and I'm in the midst of un-decorating the Christmas tree (a job I detest). I'm not fond of taking down Christmas trees either... so much more fun decorating them. Your card is one gorgeous masterpiece, girl. Congratulations! This is a very elegant card Colleen! Sounds like the wedding and reception were lots of fun! I enjoy undecorating the Christmas tree. As I put the ornaments away, I think about where we were or who gave it to us when we first used it. There are so many happy memories on that tree. So elegant! Love the soft green and cream combination! And speaking of green - what a great wedding surprise! WTG Getting published - very pretty card! How fun -- she did good! WOW that card is gorgeous Colleen!! I love the colors and the design. No secret why it got published. Congrats on the pub - I can't believe I haven't gotten this one yet!! 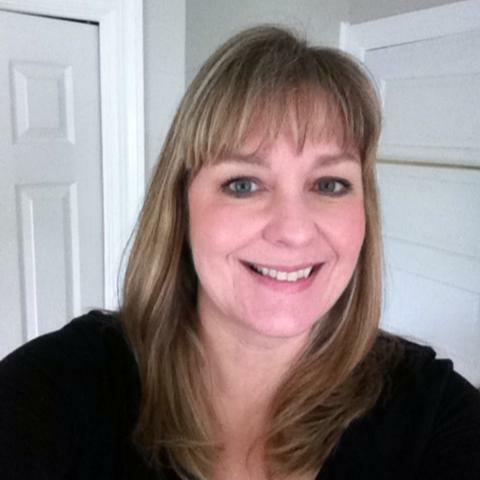 Colleen, so glad you shared those wedding pictures - fun, fun, fun and we get to see some of your family. Love the card too - it is beautiful and deserves to be in a magazine of course! They could do one of just your cards in my opinion!!! Hugz. That card is certainly deserving of publication--beautiful! 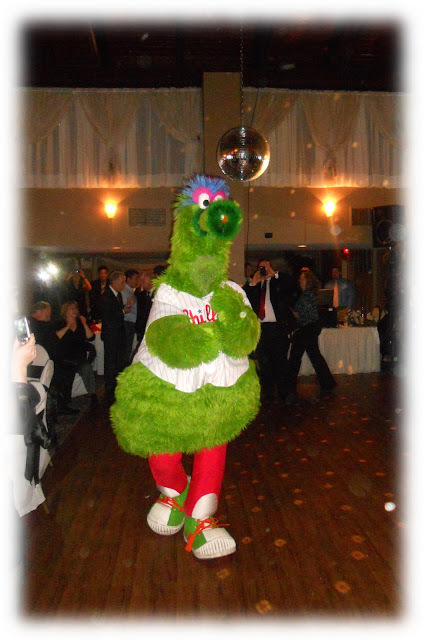 And I can't believe the Phillie Phanatic was at the wedding reception!!! What a hoot! I just love this card and what a cool story!!! I gotta pay more attention to the artist who make these cards. Sometimes I really do but this issue, I must have not really looked at. Wonderful card! Congrats on two cards in one issue. Love the story about the wedding! That wedding card is so beautiful, Colleen! I'm glad I got the chance to see it--I never was able to track down that issue. Your cousin's wedding looked like a ton of fun. Best wishes to the happy couple! Way to get published, Colleen :) You go girl. Lovely card! Well done to the bride too :) Sounds like a really fun wedding! What a beautiful card! OH MY! 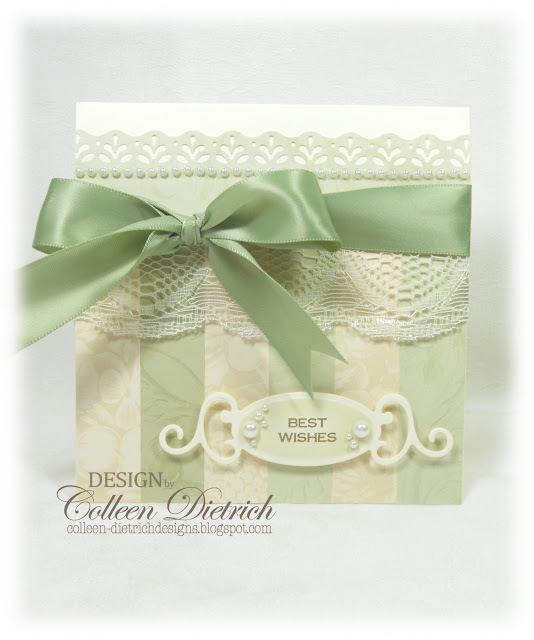 It is sooooo gorgeous--I LOVE that ribbon and that lace! That paper is SOOOOOO LUSH! And your cousin's wedding looks like SO MUCH FUN!! Esp. since she had the team mascot to come!!! HUGS! A cute and touching story, for sure! Love the beautiful card in that particular shade of green with all your special trimmings. I really love how you sprinkled on the pearls. A very nice touch! Thanks for sharing as I never had that issue! Congrats on your publication! Beautiful papers! What a fun story and you are right....she started off that marriage on the right foot, and so happy they accommodated her request! I LOL at the fact that he scrapbooks! That is hilarious and so awesome! What a gorgeous card. So soft and pretty.. I just love it. And the wedding photos look fab.. Thanks for sharing them with us.. This is so classy & chique! I love the papers, the bow and the colors, wonderful job!! Dear Colleen. What a great little story.. So so sweet.. ANd your card is just the best. SO elegant and beautiful. Congrats on getting it in the magazine. What a thril. You so deserve it. Congrats to you Colleen. and this is a very elegant card Colleen. You can see my cats on my blog. 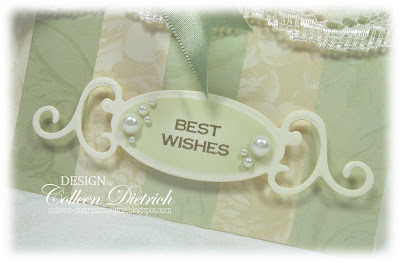 Love the delicacy of this card! Beautiful card! Congrats on the publish..I see why it made it. What a fun thing to have his favorite mascot at the wedding. I'm sure that was a huge surprise. Speaking of sports, my team won the National Championship last night. Whooppppeeeee! What a game!!!! I'm still in heaven over it. Colleen this card is so elegant! Congratulations on being published in Card Ideas. I can see why they would showcase this card! I love your wedding pics and story....so cute! i am so happy for you that your card has been published. It's absolutely fabulous and you deserved to get this beauty published. Enjoy the fame :). Love the pictures f your wdding too. Such a happy couple and what a lovely surprise for the groom. Defintely a great start of their marriage. Such a lovely idea of her! Congratulations on getting your card published. It is so beautiful. Everything about it is exquisite. How fun the wedding must have been! A wonderful surprise! Congrats again Colleen! This is gorgeous! I love everything about this one! The colors, the paper the lace... Just beautiful!